The Turrican series originated on the Commodore 64 and its existence was taken as proof that at a time when action games were usually made a) by the Japanese and b) for consoles only, the West could create a balls-out PC action game that can hang with the best of the genre. Usually defined as a fusion of Metroid and Contra, both Turrican games had huge labyrinthine levels, immense firepower, and fast-paced action. The real thrill of the game is exploring every nook and cranny and discover the secrets hidden everywhere. You are packed with weaponry, and you can roll up into a ball and drop mines as you go (hmmm...). Sadly, the C64 games are not available on the Virtual Console. But the game we get to play is usually considered the most faithful console adaptation of this franchise! The Megadrive had a complete port that suffered from problematic sound (a crime considering the quality of the soundtrack) and controls, followed by a linear original game that seemed to miss the point. But Super Turrican got the right idea. 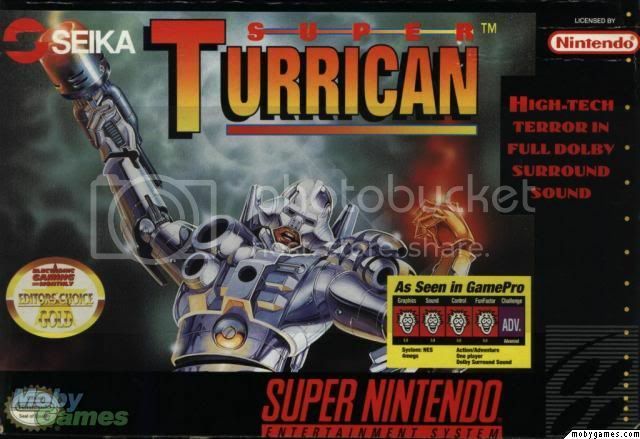 Almost completely original, and developed by the now legendary Factor 5 development studio, Super Turrican had gameplay reminiscent of the original games, a soundtrack optimized for the SNES's powerful sound chip (look at that Dolby Surround logo on the box! ), and it controls very smoothly. Purists complain about the snow level which seems out of place for the franchise, as well as the fact that the game as a whole seems like a "patchwork" of the previous games. But who cares? It's as close to the Turrican experience as we can get without getting a C64 or Amiga. Why not add Super Turrican to your collection, and indicate you are currently playing it? And don't forget to rate it when you're done! The snow level claimed my last continue as well. Not an easy game! Though a lot of it is due to me trying to go too fast and making stupid mistakes. That, and also like a dumbass, I'll see a potential 1up and jump to my death once, twice, thrice to try and get it. Still, those summary screen are depressing as hell. Got 215 cristals, missed 245, got 8 lives, missed 13! The music in the first industrial level was amazing. And I really liked the boss for that set of levels (world?). Okay I got to that on-rails part... what a joke. Ugh, the platforming bits are frustrating as hell and it doesn't help if it restarts you before the tough parts after you die later in the level. I was happy to finally beat the ice world cause of these cheap platforming sections but now I'm faced with stuff that's just as bad. Great! i bought this over the weekend. I'll log something somewhere. Did everyone update their Game Database stuff / backlog / game status? @Guillaume I really love the music in this game. It's epic and uplifting in an '80s kinda way It kind of reminds me of Valis' music. I played a little of the game on Hard Mode, and I don't think anything was different about it other than the number of continues you get. So yeah, if you're having trouble getting through the game with 3 continues, switch to Easy mode. I bet the only difference is that you get a few more continues. No shame in that. EDIT: I'm playing on Normal by the way. I died a lot of times in World 3, but I collected a bunch of extra lives in the previous two worlds, which helped. That game is AWESOME for the first stage music ALONE. I always thought the game was Japanese until I realize Factor 5 was behind it. It screams Japanese to me, even the music! That Chris Huelsbeck can make some damn good music. Anyone remember the music IGN presented from the cancelled Thornado game for Gamecube? I used to listen to that track ENDLESSLY. @carlosrox I never heard that music, but I wish Thornado had come out. Maybe whoever's in charge of the Turrican franchise today (Factor 5 didn't create it, and they're gone now so I wonder who has the rights today?) could resurrect Thornado as a Wii2 game? EDIT: I finally made it to the on-rails part you guys were talking about. That part is insane! I lost the last of my continues there. My current high score (at least what I recorded on backloggery, a level or two before I used a continue) is 139,700 points. Haven't made it yet to that on-rails thing, but I did get past the damn snow levels. There is a lot to love in this game, and some stuff to hate. The first level, for instance. I tried my best to explore every corner, but being sent to your death because of unavoidable lightning when you're platforming isn't fun. Nothing robs you of the exhilarating feeling of discovering a well-hidden secret like being hit from nowhere and sent down a hole through no fault of your own. But other than that, man, the graphics and the music combined just make me think what a great game the SNES was for action games. I'm getting vibes of Contra, the Super Star Wars games, and many more. But Super Turrican is still its own thing. I don't find that there's too many differences between the weapons. I mean, they all got some obvious unique effects, but I don't find that picking one in certain situation over the other will make a difference. I just grab every power-up I see, and they always seem to do fine. I wish I had more the reflex of turning into a ball or using that blast thing when I'm in immediate danger. I get the feeling that a good use of those abilities would have saved my life countless times. But, I simply don't have that reflex. I'd rather move around and shoot everything. An understandable feeling, probably. The snow level where you have to climb trees and time your jumps with gusts of wind that go upward was frustrating, but cool and still fun. Now I'm in the Giger's Alien levels, and they're pretty damn tough. Only one continue left, I believe. I will definitely have to start over again. But I don't mind. I like the super-powerful blue powerup the most, and the red spread shot is cool, but I don't really like the yellow shot that bounces off of walls. I'm usually just firing straight at enemies, and the yellow shot does the least amount of damage, so I have to fire for longer periods of time to kill something. Yeah I just ran out of continues. In the second world, lol. I think I'm setting this sucker to easy. I lost all my continues in Stage 11 again. Blue > Red > Yellow for me, in most situations. I prefer the spread for busier stages, but the blue is definitely the most powerful head-on. Yellow is just ehh. Sooo, Legend of Zelda is next? Didn't you say earlier you were joining us for this one? I am. I was just asking about the NEXT round, too. I'm in. On easy but I'm in. @Mr_Mustache I don't think so. I think Guillaume wouldn't consider it obscure enough for the purposes of this club. Well it depends on how many people have beaten the game already. If somehow a great number of people hasn't, and wants to, then I guess the game has a shot, but I seriously doubt it, judging by that other thread. I've completed the first quest of Zelda, and I did so just a year or so ago, so I wouldn't be too excited about playing it again Unless maybe if I did the second quest? That's not something I'm looking forward to though. I beat Super Turrican on Normal! I used all my continues in the last couple stages, but managed to beat the final boss my first try My top score currently is 182,400 points.